We are lucky enough to have visited these locations and have been able to draw on our own experience to design the holidays you see here. We have included favourite destinations, some found through serendipity, and special places to stay, which we think gives these trips an added element you won’t find in the standard routes. We hope they’ll both whet your appetite and inspire you. And, as our holidays are tailor-made, we can work with you to tweak the itinerary until we have your very own Zimbabwe holiday. There's more to see here than the Falls alone, spend a few action packed days here. Enjoy the highlights of Zimbabwe at the iconic Victoria Falls then marvel in the wildlife at Hwange National Park before exploring UNESCO's Mana Pools. 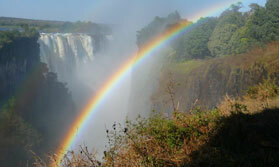 Discover the Smoke that Thunders, Victoria Falls. Enjoy a catamaran cruise on the Zambezi. See the huge herds of elephant in Hwange NP. Lake Kariba sunsets will rival those anywhere in the world. 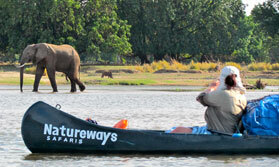 Mana Pools, a UNESCO site, explore by canoe, on foot and 4x4. 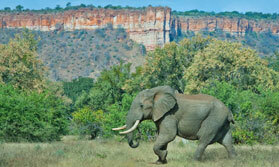 Immerse yourself in true beauty and wilderness in Gonarezhou. Explore the ancient ruins of Great Zimbabwe. Try rhino tracking on foot in Matobo Hills. Game rich Hwange National Park is waiting for you. Marvel at the natural wonder of Victoria Falls. Explore the Zambezi on a canoe safari. See sunsets on a Lake Kariba houseboat. Take in the sights of spectacular Victoria Falls. Discover wildlife rich Hwange National Park. Explore beautiful Zimbabwe from some of the country's premier locations. See Victoria Falls from the air. 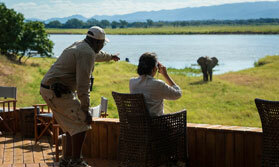 Enjoy a walking safari in Mana Pools. 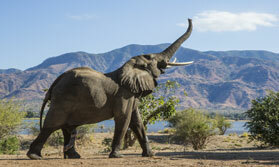 See Hwange's huge herds of elephants. Experience a Kariba sunset on a houseboat. We know and love Zimbabwe, one of our Zimbabwe travel specialists would be delighted to help you plan your perfect Zimbabwe trip.